This is the For Your Winter Binge Consideration series. Each article will talk about a show that is currently airing or has aired recently and why you might want to watch it. 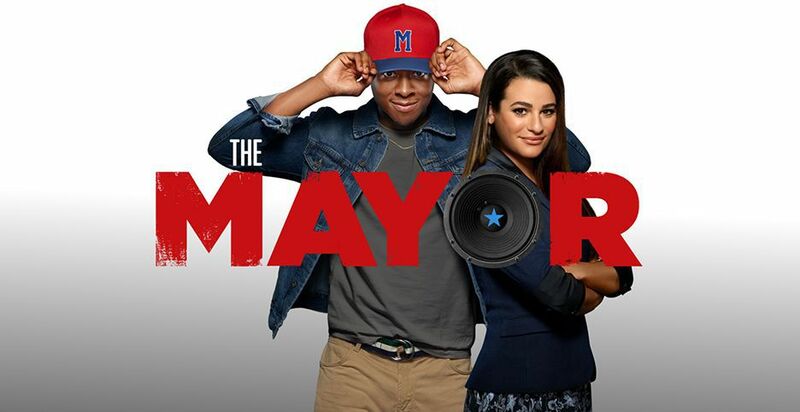 This article focuses on ABC's The Mayor. Despite the divided state of America, one thing all can agree on is that nobody can agree on an ideal politician. It has always been virtually impossible to find a candidate that caters to every voter. But, thanks to The Mayor, we now have a politician that everyone can root for. While Courtney Rose (Brandon Michael Hall) may not be a perfect mayor, his intentions are always to help the people of Fort Grey. In a world loaded with political corruption, it's refreshing to see someone who genuinely cares regardless of their fictional status. The Mayor centers on underground rapper Courtney Rose who runs for mayor as a publicity stunt to promote his career. In a surprising turn of events, Rose actually wins and has to take up a career in politics despite his lack of experience. Fortunately, he has help from his friends T.K. (Marcel Spears) and Jermaine (Bernard David Jones) alongside his chief of staff Val (Lea Michele) and mother Dina (Yvette Nicole Brown). First and foremost, the firm dynamics between the characters make the show thoroughly enjoyable. Every performer in the main cast has great chemistry with each other and they all bring something unique to the table. For instance, T.K. and Jermaine act as the comic reliefs but the writers also add depth to their characters. An example of this can be found in the episode 'The Pitch'. In that installment, the subplot focuses on T.K. 's desire of being a father and his insecurities regarding the subject. For Jermaine, he opens up about what he really thinks about Courtney's rap skills in 'Lockdown'. The Mayor could have easily let them solely act as funnymen, but the writers and actors went the extra mile to create meaningful, well-developed characters. Coincidently, Courtney plays a perfect protagonist. Hall brings him to life as a devoted rapper turned underdog politician who simply wants what's best for the city. He plays perfectly off of the by-the-book Val. As for Val, she proudly plays the nerd trope in a believable, engaging manner. To add on, Dina Rose also steals the show. The finale gives her a great moment in the sun as she runs against T.K. for a position of political power and unleashes her competitive nature. Aside from that, the juxtaposition of her sassy and caring personality traits make Yvette's character shine throughout The Mayor's first season. Last but not least, Ed Gunt (David Spade) is the perfect cartoon-like villain for the comedy series. His ruthless demeanor and selfish attitude towards Courtney made me furious while watching which simultaneously makes him the perfect antagonist. With that said, Spade's character did show off his human side in a pleasant subplot with Dina in 'Lockdown'. Unfortunately, the writers were not able to further explore this side of Gunt since the series was cut short. While classic sitcoms like Seinfeld do a great job of creating mean-spirited characters and younger comedies like Last Man on Earth are darker and focus more on plot, The Mayor simply dives head-first for laughs and feel-good moments. Every episode provides a new twist on an old storyline or creates fresh, political-based plotlines. Out of the show's 13-episode run, 'Lockdown' showcases the series at its best in every category. The episode balances comedy and character relationships in a phenomenal manner. It brings out the best of each individual in the cast and simply works marvelously as a bottle episode. Aside from that, 'Here Comes the Governor' beautifully showcases how one can easily forget what they represent in the political arena. Fortunately, T.K. and Jermaine help Courtney return to his roots. In a very powerful scene, Courtney realizes that what he stands for is more important than appealing to individuals with power. While those outings are my favorite, every episode is a gem and definitely worth watching. In the end, The Mayor shows off its strengths in the comedy and story department. The short-lived series produced 13 hilarious episodes full of heart and great moments. While ABC may have ruthlessly pull the plug on the series, The Mayor is still well-worth your time. Instead of recommending a handful of episodes, I advise everyone to watch the full series from beginning to end. This behind-the-scenes look at the life of a rapper turned mayor is truly a fun, engaging ride. Arsenio Hall and E-40 make some great guest appearances on the show. "The crooks in the government think they're so clever. They say it's coming soon. We know it's coming never." Beautifully said. That freestyle rap battle in 'Lockdown' was epic. This show would make a perfect companion with FX's Atlanta. My description of the series: A mix of Atlanta and the Chris Rock movie Head of State. You can watch some episodes on the ABC website and all episodes on Hulu. The series also has its own music on Spotify. If you're into rap, it's pretty good. Much love to the entire cast and crew of the series. Did I persuade you to watch the series? Are you already a fan of The Mayor? Would you like to see more? Leave your thoughts in the comments below.